This historic winter has spawned a tremendous uptick in the number of potholes affecting municipal roads. In response, the Township this week launched an aggressive campaign to identify and repair the affected areas. Three crews have been assigned to seek out and fix problem areas, and we have launched a new Report a Pothole feature on the Township website, so that motorists can report problem spots 24 hours a day, 7 days a week. Residents can also report potholes by calling (856) 424-4422. Potholes reported to us on state- and county-owned roads will be referred to the proper authorities. This enhanced pothole-response team will remain in effect for as long as necessary. Click here for additional information. Thank you in advance for helping to keep our roads safe as we emerge from winter and look toward spring. We’re looking to expand the Mayor’s Citizens Cabinet! For the last two years, I’ve had the unique opportunity to interact with Cherry Hill residents, through the creation of my Citizens Cabinet. Every other month, a few dozen residents come together for a casual but enlightening conversation about current events and hot topics in Cherry Hill. Attendees have the chance to ask important questions and get information directly from me and my administration about new policies and programs, businesses, neighborhood improvements, and hot topics in neighborhoods across town. Our most recent meeting, for example, held yesterday in the Township Community Center, featured an introduction to our new Police Chief, a recap of this winter’s snow removal and pothole-patrol efforts, and a preview of upcoming events. Our conversations are casual, but always lively and enlightening. I am looking to expand the Citizens Cabinet, and add a few new perspectives to this lively and diverse group. The Citizens Cabinet meets every other month from 8 to 9:30 a.m., and if you’re interested and eager to engage your Township officials, I hope you’ll apply. For additional information, call my office at (856) 488-7878. Interested residents should send a brief e-mail of interest, along with your contact information, to Donna Dovey at ddovey@chtownship.com. Then, come out and hear directly from me and my key staff, and learn more about what is happening across Cherry Hill. The Citizens Cabinet will meet again in April. I hope to see you there! As part of an ongoing water main replacement project, New Jersey American Water has scheduled work in Cherry Hill next week. An NJAW contractor is scheduled to begin work on Rolling Lane on Monday, Feb. 24, and on Kitty Hawk Road during the second half of the week. All work is weather-permitting. Service will not be affected other than for a short period of time when individual service lines will be connected to the newly installed water main. Homeowners will be notified when that brief shutoff is scheduled to occur. Access to homes and driveways will be maintained throughout the duration of the project. Click here for more information. For concerns about this project, please contact John Graham or Jacquelyn Weaver at (856) 764-6920 or 6915. Learn how to create dynamic, high-impact presentations faster than ever. This class focuses on the basics of creating and presenting a Microsoft PowerPoint 2007 slide show. In this hands-on class you will be learn how to create a presentation using slide layouts, design themes, animations and templates. Free. Registration required, open to Cherry Hill Library cardholders first. Call (856) 903-1246 to register. Ready to dance? This dance party is specially designed for children ages 18 months to 3 years. Join us for a rockin’ good time full of music and movement. This event is free and open to the public. No registration required. Join the Friends of the Library to find great bargains on thousands of books, CDs and DVDs. Books are sorted into categories; prices are as follows: Hardback books, CDs and Videos are $2, and paperback books are $1. On Saturday, buy a bag of books for $5. All proceeds benefit the Library. Friends members can access the sale beginning at 6:30 p.m. Wednesday, March 12. Public hours are: 9:30 a.m. to 9 p.m. March 13; 9:30 a.m. to 5 p.m. March 14, and 9:30 a.m. to 4 p.m. March 15. On Tuesday afternoon, I helped celebrate the Grand Opening of the Benefit Consultants Group’s new corporate headquarters at 51 Haddonfield Road. Benefit Consultants opened in 1958, and their growth is a testament to their continued success. More than 150 guests attended the special ribbon-cutting ceremony and toured the company’s new facility, and I presented a special proclamation on behalf of the Township. To read more about Benefit Consultants, Tuesday’s grand opening, and why the company chose to open its new headquarters in Cherry Hill, click here. Please join me in welcoming BCG into our community; I wish the company and its employees and executives all the best in the years to come. The Mayor’s Wellness Campaign is gearing up for spring! This past Wednesday, more than a dozen residents joined in this month’s Walk with the Mayor at Cherry Hill Mall, and we’re looking forward to another exciting event next Saturday, March 1, in cooperation with one of our Mayor’s Wellness Partners, Power Train Sports Institute. This special Fitness and Wellness Expo, featuring free demos, refreshments, and prizes, will be held from 10 a.m. to 2 p.m. next Saturday, March 1, at Power Train’s facility at 5 Esterbrook Lane. Click here for details. If you can’t make it on March 1, don’t worry; there are plenty of Wellness activities coming up in the next few months, including our next Walk with the Mayor, at 8 a.m. March 19. Click here for our full events calendar. For additional information, call (856) 488-7878, or email MWC@chtownship.com. Help shape the future of the Mayor's Wellness Campaign! Speaking of Mayor’s Wellness, we are currently looking for new members for my Mayor’s Wellness Advisory Committee. These dedicated volunteers help plan new Wellness programs and activities, and help promote the Mayor’s Wellness Campaign throughout the Township. You’ll work closely with my staff and have the opportunity to help make healthy living a part of everyday life in Cherry Hill. “Wellness” is about more than just working out or eating right – and we’re looking for men and women who share that philosophy. Interested applicants should send a letter of interest, along with your name and contact information, to MWC@chtownship.com, by Feb. 28. The Committee will meet monthly, and is scheduled to meet the first week in March; selected applicants will be notified with complete details prior to the meeting date. For more information on the Mayor’s Wellness Campaign, or for questions about the Committee, e-mail us or call (856) 488-7878. Cherry Hill will host a free, daylong Conference for Professionals and Parents of Children with Special Needs, from 8:30 a.m. to 1:30 p.m. Saturday, March 8, at the Carman Tilelli Community Center. Learn about a variety of topics and issues, and connect with representatives from federal, state and local agencies, as well as two special featured speakers. The conference is hosted by Cherry Hill Township, the Ombudsman for Disabled Citizens and the Cherry Hill Alliance, and is sponsored by the Ellisburg McDonald’s and Wegmans. A continental breakfast will be served. Attendance is free, but registration is recommended. Click here for more information. The Township is currently accepting names for the 2014 Plant-A-Patch Wait List. Plant-A-Patch, the Township’s popular community gardening program at the historic Barclay Farmstead, offers 25-foot by 25-foot plots for a fee of $30 per season, which runs from mid-April through mid-October. For more information or to add your name to the wait list, contact Sandra Ragonese at sragonese@chtownship.com or (856) 488-7886. Cherry Hill Township and the AARP offer seniors free tax-preparation assistance, from 10 a.m. to 2 p.m. every Tuesday and Friday through April 15. Sessions will be held in the N. John Amato Council Chambers, at the Township Municipal Building. For additional information, click here, or call the AARP directly at (888) AARP-NOW. This historic winter has spawned a tremendous uptick in the number of potholes affecting municipal roads. In response, the Township this week launched an aggressive campaign to identify and repair the affected areas. Three crews have been assigned to seek out and fix problem areas, and we have launched a new Report a Pothole [http://www.cherryhill-nj.com/FormCenter/Roads-8/Report-a-Potholes-45] feature on the Township website, so that motorists can report problem spots 24 hours a day, 7 days a week. Residents can also report potholes by calling (856) 424-4422. Potholes reported to us on state- and county-owned roads will be referred to the proper authorities. This enhanced pothole-response team will remain in effect for as long as necessary. Click here [http://www.cherryhill-nj.com/CivicAlerts.aspx?AID=460] for additional information. Thank you in advance for helping to keep our roads safe as we emerge from winter and look toward spring. For the last two years, I’ve had the unique opportunity to interact with Cherry Hill residents, through the creation of my Citizens Cabinet. Every other month, a few dozen residents come together for a casual but enlightening conversation about current events and hot topics in Cherry Hill. Attendees have the chance to ask important questions and get information directly from me and my administration about new policies and programs, businesses, neighborhood improvements, and hot topics in neighborhoods across town. 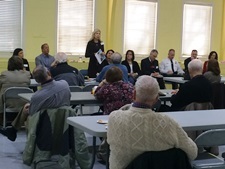 Our most recent meeting, for example, held yesterday in the Township Community Center, featured an introduction to our new Police Chief, a recap of this winter’s snow removal and pothole-patrol efforts, and a preview of upcoming events. Our conversations are casual, but always lively and enlightening. I am looking to expand the Citizens Cabinet, and add a few new perspectives to this lively and diverse group. The Citizens Cabinet meets every other month from 8 to 9:30 a.m., and if you’re interested and eager to engage your Township officials, I hope you’ll apply. For additional information, call my office at (856) 488-7878. Interested residents should send a brief e-mail of interest, along with your contact information, to Donna Dovey at ddovey@chtownship.com [mailto:ddovey@chtownship.com] . Then, come out and hear directly from me and my key staff, and learn more about what is happening across Cherry Hill. The Citizens Cabinet will meet again in April. I hope to see you there! This is just a snapshot of the hundreds of events, classes, activities and cultural programs held at the Cherry Hill Library throughout the year. Click here [http://host6.evanced.info/cherryhill/evanced/eventcalendar.asp] for the full events calendar, and visit www.chplnj.org [http://www.chplnj.org/] to sign up for CHPLink, the library’s e-newsletter. Stay connected by following the Library on Facebook [https://www.facebook.com/CHPLibrary?ref=search&sid=1520477213.2684015648..1] , Twitter [https://twitter.com/CHPLibrary] and Pinterest [http://www.pinterest.com/chplnj/] . For more information on any library program, call (856) 667-0300 or email info@chplnj.org [mailto:info@chplnj.org.Cherry] . On Tuesday afternoon, I helped celebrate the Grand Opening of the Benefit Consultants Group’s new corporate headquarters at 51 Haddonfield Road. Benefit Consultants opened in 1958, and their growth is a testament to their continued success. More than 150 guests attended the special ribbon-cutting ceremony and toured the company’s new facility, and I presented a special proclamation on behalf of the Township. To read more about Benefit Consultants, Tuesday’s grand opening, and why the company chose to open its new headquarters in Cherry Hill, click here [http://www.bcgsecurities.com/blog/?p=983] . Please join me in welcoming BCG into our community; I wish the company and its employees and executives all the best in the years to come. Speaking of Mayor’s Wellness, we are currently looking for new members for my Mayor’s Wellness Advisory Committee. These dedicated volunteers help plan new Wellness programs and activities, and help promote the Mayor’s Wellness Campaign throughout the Township. You’ll work closely with my staff and have the opportunity to help make healthy living a part of everyday life in Cherry Hill. “Wellness” is about more than just working out or eating right – and we’re looking for men and women who share that philosophy. Interested applicants should send a letter of interest, along with your name and contact information, to MWC@chtownship.com [mailto:MWC@chtownship.com] , by Feb. 28. The Committee will meet monthly, and is scheduled to meet the first week in March; selected applicants will be notified with complete details prior to the meeting date. For more information on the Mayor’s Wellness Campaign, or for questions about the Committee, e-mail us or call (856) 488-7878. Cherry Hill will host a free, daylong Conference for Professionals and Parents of Children with Special Needs, from 8:30 a.m. to 1:30 p.m. Saturday, March 8, at the Carman Tilelli Community Center. Learn about a variety of topics and issues, and connect with representatives from federal, state and local agencies, as well as two special featured speakers. The conference is hosted by Cherry Hill Township, the Ombudsman for Disabled Citizens and the Cherry Hill Alliance, and is sponsored by the Ellisburg McDonald’s and Wegmans. A continental breakfast will be served. Attendance is free, but registration is recommended. Click here [http://www.cherryhill-nj.com/DocumentCenter/View/2116] for more information. The Township is currently accepting names for the 2014 Plant-A-Patch Wait List. Plant-A-Patch, the Township’s popular community gardening program at the historic Barclay Farmstead, offers 25-foot by 25-foot plots for a fee of $30 per season, which runs from mid-April through mid-October. For more information or to add your name to the wait list, contact Sandra Ragonese at sragonese@chtownship.com [mailto:sragonese@chtownship.com] or (856) 488-7886. Cherry Hill Township and the AARP offer seniors free tax-preparation assistance, from 10 a.m. to 2 p.m. every Tuesday and Friday through April 15. Sessions will be held in the N. John Amato Council Chambers, at the Township Municipal Building. For additional information, click here [http://www.cherryhill-nj.com/CivicAlerts.aspx?AID=451] , or call the AARP directly at (888) AARP-NOW.